What's the difference between running an average event and a high-quality one? Most certainly, both types of events must provide flawless logistics and planning. Also, in both cases, attendees should have access to solid content and a meaningful networking environment. And both events must consider the attendee's goals, expectations, and needs. So what exactly levels up the quality of an event? Is it the venue? The program structure? The catering? The answer is quite simple: If you took the same conference (flawless logistics, amazing speakers, delicious catering, ...) and changed the accents slightly, you'd end up with two different events. The first would be an event-centric conference, where the attendees are passive participants. The second one would be an audience-centric conference, where the guests are actively interacting with their environment through experiential marketing. The difference between just sitting through an event and engaging with it through different activities is obvious. According to the Future of Customer Engagement and Commerce, for experiential marketing to happen, you must "bring your target group on board in the creative process and have them participate in various marketing activities, thus creating moments in which they are intensely engaged with your brand." Usually attendees interact with event content at a cognitive level. How about engaging their senses, too? Think about specific settings that would encourage your guests to get carried away. For example, you could use a special fragrance for the event, so guests could identify their experience with that specific aroma. To achieve a more dynamic effect, you could use a fresh, green, casual fragrance. On the other hand, if there's a possibility to put certain event topics into practice, you could think about setting up a special sensorial experience. For example, if you're running a conference on the automotive future, you could design a space where the attendees could 'feel' the upcoming innovations. To accomplish this, you could engage your audience in an immersive experience, involving virtual or augmented reality settings. Transform your passive audience into a constant resource of energy and co-creation. Get rid of the old event format, and let your guests become the main protagonists of the event. You could do it by involving your audience in a creative, yet fun activity. For example, let's say that your event is related to public spaces and urbanism. A complex and serious topic, isn’t it? Is there a possibility to engage your audience differently without giving them hard tasks such as solving specific urban problems in groups? Definitely! Here's how: Form different groups and invite your attendees outdoors, where you’ll have prepared a few walls and enough color spray paints. On the walls, graffiti experts had previously drafted the contours of the future painting. Now, the only thing the groups have to do is approach the assigned wall and start spray-painting it (of course, with the assistance of a graffiti expert who’d explain the process). Apart from being fun and creative, the activity will straighten the relationship between the attendees and leave a powerful memory about the event itself. Red Bull is one of the top leaders in phenomenal experiential marketing. 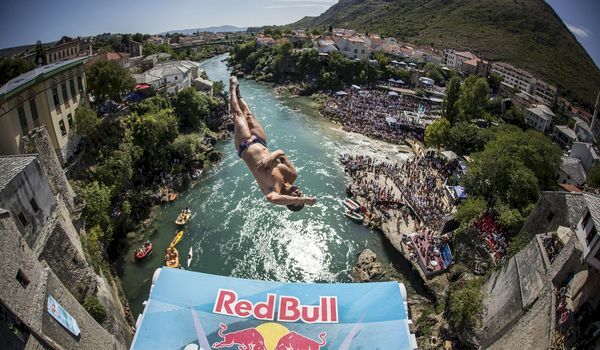 With the Cliff Diving project (an annual international series of cliff diving events), the company reinvented the urban sport, also offering awesome shows in different cities, and strengthened its market position. The reason for Red Bull's success? Its event generated a powerful sense of awe and epicness. People who assisted at the Cliff Diving events were able to immerse themselves into adventure mode. Considering this, you could use the sense of astonishment to boost the quality of your event. To do so, think about a specific activity or setting (a performance act, for example) that will help your attendees achieve a breathtaking state of mind. When it comes to planning an event, you have two options. The first one is to plan average and boring events with a low impact and mediocre memories. The second one is to boost the quality and the awesomeness of your events through experiential marketing practices. In case you choose the second option, think about how you could upgrade the experience of your attendees and enrich them with different event settings.